It's Almost Fall, Have You Scheduled An Appointment For Lawn Dethatching? Thatch on your lawn can make it look unhealthy and unsightly, even when you spend plenty of time caring for it. This is the name for the brown layer that lies between healthy soil and green grass in your yard. Compressed roots and stems, along with other dead and decaying organic material, form thatch that makes it difficult for your lawn’s roots to grow normally. When this happens, your lawn is in danger of being taken over by pests and the diseases they bring with them. Here at The Lawnsmith, we recommend that our customers schedule an appointment for lawn dethatching in mid to late August. Our crew removes some of the thatch layers that have built up between the soil underneath it and the grass on top of it. This is essential to the long-term health of your lawn. When we are done with dethatching, we remove all debris from your property at no extra charge. We are happy to recommend a regular dethatching schedule based on the size of your lawn and the type of grass it contains. Late summer is the ideal time for dethatching because heat waves are most likely over and the grass still has plenty of time to recover before the first frost. In a cool-weather state like Minnesota, grass grows most vigorously at this time of year. Dethatching can be hard on a lawn, so leaving adequate time for it to re-grow healthy grass is ideal. 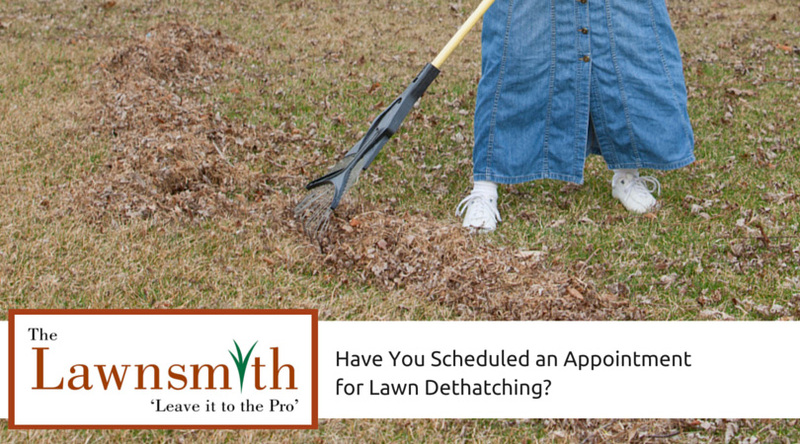 It’s also best to start dethatching when the soil is moist, neither too dry or too wet. Our lawn care crew can determine the best time by visiting you at home and measuring the moistness of your soil. We never dethatch during a drought as this could permanently damage your lawn. Lastly, we recommend mowing your lawn to approximately half its normal height before we start the dethatching process. Nothing is certain in lawn and garden care — except for weeds, which often take the form of dandelions. These wild, pesky plants grow where you don’t want them to grow, and they can keep you busy pulling them all summer long. The key to long-term weed removal is stopping the plant at its root. But in order for that to happen, you must first identify a weed and make sure that it is not actually a beneficial plant. Some plants look like weeds, while some weeds look like legitimate plants. Also, to provide protection against toxic plants, consider wearing gloves when weeding. Once you’ve ID’d the weeds, keep in mind that the softer the ground, the easier it is to remove them. If possible, plan your weeding work for after a rainfall. Use your hands to grip the stem as far down as possible and pull the weed from the ground. A small weed-removal tool will do the trick, too — especially when dealing with dandelions — and will help you attack and remove the root faster and more easily. To remove larger weeds, you may need to loosen the dirt around the weed to access its roots. After the weed is gone, use your hands or the digging tool to smooth over the newly weed-free surface and prevent further weed growth. In gardens, a small hoe can help rework the disturbed dirt. Collect all removed weeds in a bucket or bag and dispose of them. Tossing weeds to another part of your lawn increases the odds of their seeds taking new root. You don’t want the elimination of one problem to be the beginning of the next problem. 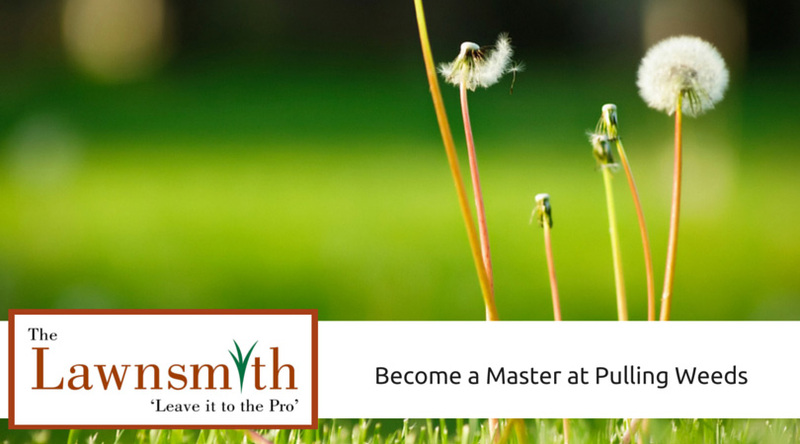 In grassy areas where weeds keep returning, consider using a spot spray. Just remember to keep children and pets away from the affected areas until the spray has settled. Keep in mind that proper lawn care and preventive maintenance are the best ways to reduce the prevalence of weeds. Fertilizing your lawn will keep it healthy and dense, allowing less room for weeds to fester. And because some products combine fertilizer with weed control, you can complete two important lawn care tasks at the same time. Read our most popular articles! Preparing for Spring? Book Your Lawn Care Service Now!